Oscar lost his two rear paws in an encounter with a combine harvester in October 2009. Owners Kate and Mike Nolan took him to their local veterinarian, Peter Haworth. In turn, the vet referred Oscar to Dr. Noel Fitzpatrick, a neuro-orthopedic surgeon in Eashing, a few miles southwest of London. The 2-1/2 year old black cat with green eyes was outfitted with metallic pegs that link the ankle to the foot. Oscar is now back on his feet, walking, running, and jumping. 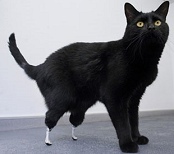 Together with biomedical engineering experts, Fitzpatrick gave Oscar two metal prosthetic implants that are a bit wobbly, to imitate a cat's natural walk. Fitzpatrick said he and biomedical engineers designed the artificial paws so that they would be fused to the bone and skin. "That allows this implant to work as a seesaw on the bottom of the animal's limbs to give him (an) effectively normal gait," he said. "Oscar can now run and jump about as cats should do." The surgery will probably not be widely used, since the cost of the prosthetics are approximately $3,000 apiece, plus the cost of the operation itself. Oscar isn't the first bionic cat, though he's the most noticeable. In 2008, Fitzpatrick made an artificial knee for a cat named Missy who had been struck by a hit and run driver.